A food allergy can be described as an immune response in which your body reacts negatively to a certain type of food. As a result, your immune system produces antibodies for fighting off the allergen. Every time you come into contact with that particular food (touching, inhaling or eating); your body releases chemicals called histamines to protect itself. This chemical is the cause of symptoms such as swelling, wheezing, rash, itching, runny nose and so on. 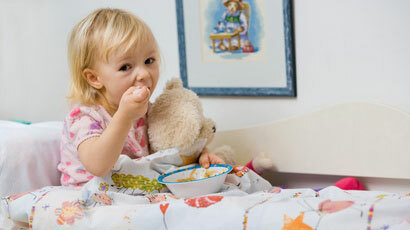 Soy is a widely used legume which triggers allergic reaction in a large percentage of kids. Data shows that around 0.3% of the kids suffer from soy allergy. While several kids outgrow this allergy, others live with it right through adulthood. Fortunately, the symptoms of soy allergy are relatively mild and can be controlled with the help of over-the-counter antihistamines. In rare cases, children need to visit the emergency room after having soy and an epinephrine injection may be required. Avoiding soy isn't easy, as there are so many packaged products which contain some by-product of this legume. Nevertheless, ensure that your child stays away from soy milk, soybean, Chinese food (because of the soy sauce), edmame, tofu, Tempe, miso and textured vegetable protein. Check the label of any food product for the words "contains soy". Second only to milk allergy, egg allergy is the most common type of food allergy in toddlers and infants; in older kids, it is the most common allergy, affecting about 2.5% of the younger population. It generally occurs in infancy, though most kids outgrow egg allergy by the time they reach adolescence. For some though, it continues right into adulthood. They symptoms of egg allergies can vary from one child to another. Moreover, the symptoms manifest themselves immediately in some kids whereas they take their time in others. Egg allergy, like any other allergy, cannot be cured. The treatment includes antihistamines, but it is best to keep an epinephrine auto-injector close by, at all times. A trip to the emergency room may be required in case of anaphylaxis after having eggs. The only way to prevent an allergic reaction is to avoid eggs completely. It happens to be a very common ingredient, used in a lot of foods and therefore, eliminating it from a diet is a challenge for any parent. This means that you need to read the labels of all packaged goods carefully and stay away from any of them that contain eggs (solids, dried, whites, yolks or powdered), albumin/albumen, mayonnaise, eggnog, lysozyme, meringue and ovalbumin. In case your child displays adverse symptoms after drinking milk or consuming any dairy product, he is probably allergic to milk. Strange though this may sound, milk allergy is the most common food allergy prevalent in infants, toddlers and children. Data shows that around 2.5% of the kids below the age of 3 have allergic reactions to milk and dairy products. It is essential to keep the pediatrician informed about the reaction your kid has to milk. This allergy should not be confused with milk intolerance. If you notice symptoms like wheezing, vomiting, diarrhea, rash, itching, swelling, watery eyes or a runny nose, it is probably an allergy. When it comes to milk allergy, prevention is the only cure! Make sure that you keep your child far away from milk and any kind of dairy products. However, because milk is a common ingredient used in several products, your child may come in contact with it, despite your best efforts. In case that happens, you need to have antihistamines at hand for relieving the symptoms. In case the symptoms are severe, seek immediate medical attention as an epinephrine injection may be required. Seek immediate medical attention in case the allergic symptoms get too severe as there is always a chance that it might turn fatal.